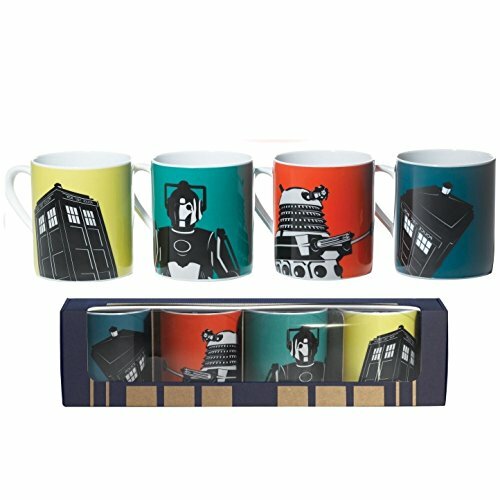 Officially licensed BBC merchandise set of 4 fine porcelain Mugs featuring a selection bold and contemporary images on a vibrant colour background. Including Tardis, Dalek and Cyberman designs. Premium Stoneware mug housed in a BBC DOCTOR WHO and Police Public Call Box branded presentation box. BBC Worldwide launches this fabulous new Doctor Who Home collection. The new premium, home-ware range is inspired by one of the country’s most loved TV shows. It is graphic, bold and contemporary, inspired by the iconic and instantly recognisable Tardis, Daleks and Cybermen.